Mayor Travis Marion is the 16th elected Mayor of the Town of Rising Sun. After serving as Parks & Recreation Commissioner for two years prior, Mayor Marion remained project manager through the completion of the construction of Triangle Dog Park, a wetlands observation area, and a complete renovation of Veterans Community Park. Mayor Marion has focused his public service on promoting our parks system, making streets safer, promoting economic and community development, and ensuring that government budgets work effectively. Mayor Marion has served on numerous boards and commissions, including the Cecil County Mayors Drug Task Force, Cecil County Economic Development Commission, Maryland Mayors Association, Maryland Municipal Leagues Communication Committee, and the Cecil County Broadband Task Force. Mayor Marion, while born in Rising Sun, has lived in Arizona, Virginia, and North Carolina before settling back in Rising Sun, at the age of 10. 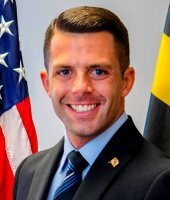 Mayor Marion is a 2005 Rising Sun High School Graduate, attending Wilmington University and completing his degree in History, Mayor Marion also currently is attending Wilmington University majoring in Government and Public Policy.